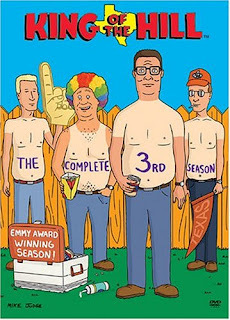 Shows often hit their stride around season 3, and I’d say the same applies to King ofthe Hill, though it was extraordinarily well-shaped from the very first episodes. While a syndicated show, King of the Hill actually does interesting things with its continuity – Luanne in particular has a lot of interesting moments of development, with her boyfriend dying in the cliffhanger from the previous season and a subsequent period of soul-searching as her hair grows back. The season also introduces the potential for Hank to get a step-brother even in his middle age, the birth being part of the finale here. Largely, though, where King of the Hill succeeds is in its complexity and dark undertones. Hank’s father Cotton is pretty central to this, being an abusive and misogynist embodiment of all the left hates about small-town right-wing America. He is central to several season highlights, including a moment of lightness when he takes the fall for Bobby in an embarrassing predicament and one good moment for Hank where he finally stands up to him to defend his mother – and his mower. The way others act around Cotton is often very funny, but for a comedy show there’s a lot that’s chilling and unpleasant about what he embodies. This is a show with a fantastic ensemble cast, though. All Hank’s friends and family have their brilliant moments. The main gang are consistently amusing, Luanne has the show’s best one-liners, Peggy is by turns an unstoppable force of nature and incredibly naïve, especially when it comes to matters of adultery (her realisation of it making for one of the highlights of the show so far) and the way Bobby mystifies his family is by turns funny and affectionate. Not every episode is a hit. Bill losing it and starting to impersonate his ex-wife is too far for what was previously a subtle character quirk. The dolphin episode stretches credulity and Hank’s character too far. The Rashomon episode (which I just noted was a family trope in my thoughts on My Little Pony:Friendship is Magic season 6) was a little slow and exaggerated. But these were certainly the minority, and the vast majority of the episodes were very funny and often quite touching. It’s the episodes that are centred on small problems dealing with the modern world that shine, like Peggy playing in a softball team or the problems with taking Bobby hunting. I also liked episodes centred on Kahn, who is a remarkably subtle and multifaceted character for what would in many ways have been a token outsider role. Probably the best element on the show’s more complex side is Peggy’s deep-seated sadness about not being able to have another child. It becomes less and less subtle but was at its best with her reactions to Hank trying to get his dog to breed. The show is certainly strong at this stage, and a pleasure to watch. But will it continue that way? I’m not sure just now, but I’m happy to keep watching.